Listening to Imagine Dragons is like being inundated with a tide of ragged glory and post apocalyptic glee. The Las Vegas based band puts their finger on your pulse then gets impatient; grabs your wrist, then runs off with you into the sunset. 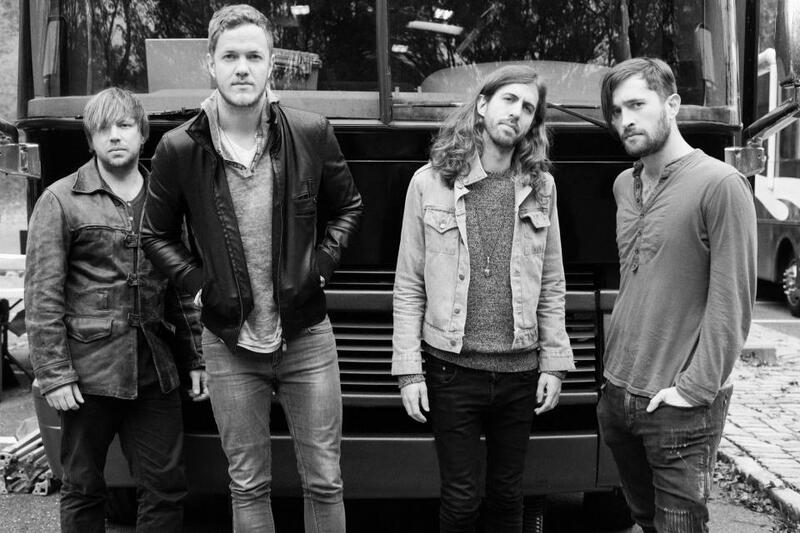 Though just recently making it big on the music charts, Imagine Dragons has been working hard since they won the Battle of the Bands at Brigham Young University in 2008. “Even though the scale has gotten larger, we’ve been touring and playing music for years now. The ‘break into the music scene’ wasn’t an immediate thing where one minute we weren’t in the scene and the next we were – it was a very gradual and organic growth,” points out drummer Daniel Platzman. Since 2008 they’ve released three EPs independently before making their big label debut with 2012’s Continued Silence. Later that same year saw the release of their first full-length album, Night Visions. Off of that album, singles ‘Radioactive’ and ‘Demons’ rocketed to the top of the charts. Regarding the rather unexpectedly absurd music video for ‘Radioactive’ Platzman explains, “we wanted to keep our fans on their toes with this music video. We knew a lot of people were expecting a post apocalyptic video, but we wanted to do something fresh and different.” Not a surprising assumption considering the content of the song and since the video for ‘It’s Time’ was set in a barren wasteland. But “we’re big fans of bands like the Foo Fighters, who don’t always take themselves too seriously.” Since the video involves a Muppet-like dog-fighting ring and a pink teddy bear with laser beam eyes, it looks like they succeeded. The band is more than their music, this year they helped start a charitable foundation; “The Tyler Robinson foundation is a charity to help families with a child with cancer pay for their medical bills. It’s in honor of Tyler Robinson, a friend of ours, who inspired us with his amazing attitude and outlook on life as he battled cancer,” Platzman says. There are some more fundraiser plans down the line, but if you want to help sooner check out tylerrobinsonfoundation.com for more information. To catch a glimpse of Robinson’s incredible spirit, take a look at the end of the music video for ‘Demons’. Imagine Dragons will be playing the Launch Festival on Sunday at 8:50 pm at Cesar Chavez Park; Tube will see you there. Imagine Dragons is playing LAUNCH in Sacramento on Sunday September 8th. For more information about the show visit the LAUNCH website. Tags: Cesar Chavez Park, CESAR CHAVEZ PARK LAUNCH, City of Sacramento, concert, Concerts in the Park, dance, downtown sacramento, Imag, Imagine Dragons, Imagine Dragons band, Imagine Dragons concert, Imagine Dragons music, launch, Launch 2013, launch CESAR CHAVEZ PARK, Launch Festival, Launch Festival 2013, LAUNCH lineup, LAUNCH music, live music, live music sacramento, local concerts, local music, local shows, Midtown, midtown sacramento, Music, Music Festival, sac music, sacramento music, things to do, TUBE. Bookmark the permalink. Previous post ← Metaphorically Speaking.